The Guardian today carries an article listing London's top 10 worst gyratories. 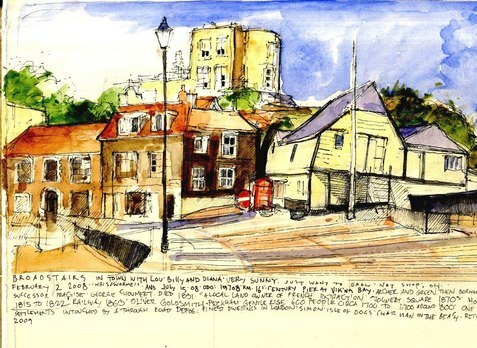 Lambeth's Vauxhall Cross gyratory is listed at number five. With five lanes for cars, one for buses and cycle lanes squeezed onto narrow pavements around the outside, here the car is king. At crossings, cyclists and pedestrians squeeze onto small islands while traffic rages around a bus depot in the centre of this oversized roundabout. With limited crossing facilities heading north from the bus station a few try to cross it on foot. As with other gyratories, traffic comes in fast, angry waves with aggressive responses to anyone holding up traffic, even to taxis picking up fares from outside a supermarket. 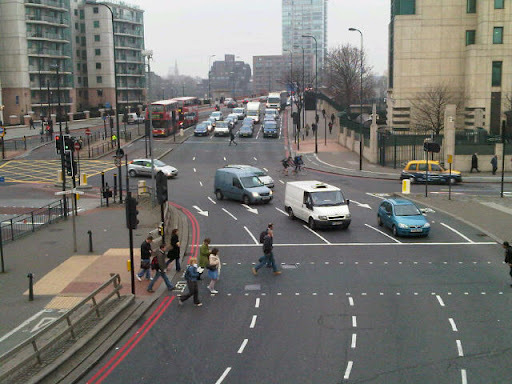 Lambeth Cyclists have been campaigning for the removal of the Vauxhall Crosss gyratory for many years as we believe it is unsafe for cyclists and pedestrians. Former Mayor of London Ken Livingstone outlined plans in 2003 to abolish Vauxhall Cross and other gyratories in London as part of his long term transport strategy. Recent indications from TfL suggest that change may again be on the horizon. We live in hope. A new bikeshop Balfe's Bikes (pictured) has opened at 338 Kennington Park Road, SE11 (next to the South Pacific Pub) - a welcome addition to the area. The new shop offers bikes, accessories, repairs and servicing - the shop offers a 10% discount for LCC members on spares and accessories. The new shop is open 8am -6pm Monday to Friday and 10am -5pm Saturday. 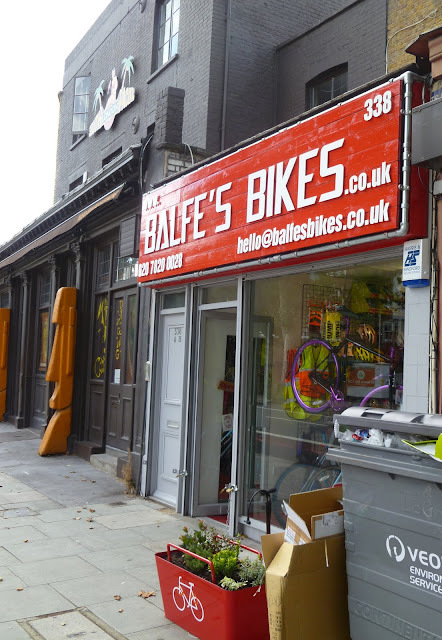 The shop is run in association with Balfes Bikes in East Dulwich. 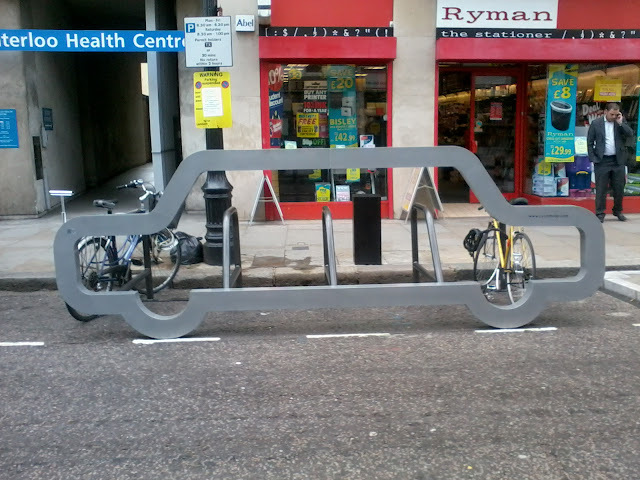 Thanks to Kennington People on Bikes for the information! Come and see us at the Lambeth Country Show this weekend! 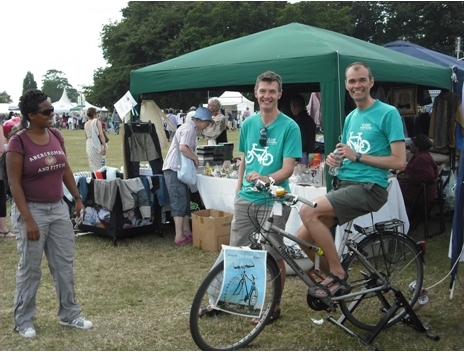 Lambeth Cyclists will be at the Country Show on both days handing out information on cycling in Lambeth and South London, We will also have our pedal powered music machine. 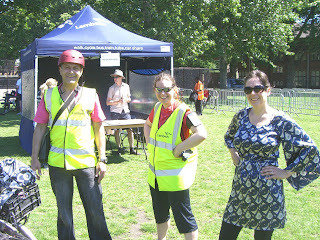 So come and find out about cycling at the Lambeth Cyclists stall in the charities area. As ever, we will need a few volunteers to help out on our stall. It's really just to chat to people about cycling. No special knowledge required, it's simply about sharing any tips and advice as cyclists yourselves with people who may be thinking of taking up cycling. We may need more people later in the afternoon on the Saturday as some people may be on the Architecture Ride, but any day you can make would be greatly appreciated. Our programme of events for Bike Week 2011 was varied ranging from a cyclists’ breakfast and Dr Bike at which we spoke to cyclists passing on Brixton Road to specialist rides such as the incredible edible Lambeth ride exploring food growing in Lambeth, an architecture ride looking at the work of Norman Shaw and a bike related film. The week finished with a Lambeth Council organised event: Bike the Borough where a fabulous sunny day saw hundred of riders cycle around Lambeth visiting parks over an 18.5 mile circuit. 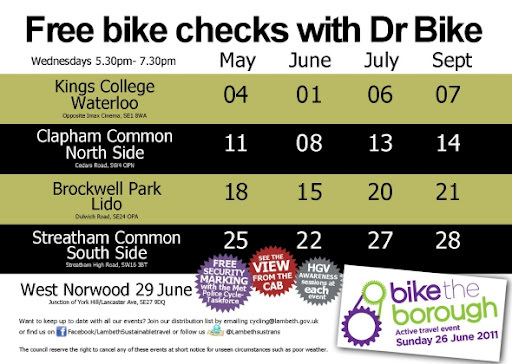 As well as the signed route there were led rides between four hubs of at Archbishops Park, Clapham Common, Streatham Common and Brockwell Park where entertainment and bike related events were taking place. It was a great opportunity for everyone, young and old to discover the borough in a friendly non competitive way. Lambeth really is worth exploring and this offered locals, visitors, families, friends and people looking to meet fellow cyclists the perfect opportunity to do so. Following a debrief with the organisers at our July meeting plans are going ahead for the 2012 event: to be held on 24 June 2012 – watch this space!